I guess that’s one FaceBook friend down. I have all of these 4,000+ FaceBook friends and today I’ve been messaging one of them and she me, back and forth. In response to her last message I suppose I got a bit over zealous in responding and wrote a very long response. After I sent the message, I noticed she got off of FaceBook. Why oh why can’t I say anything briefly? The Mermaid Room is looking better now. The curtains are not exactly as I imagined they would turn out, but they will do for now. There are just so many projects and decorating to do in that house. 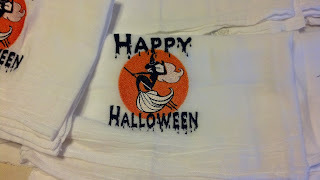 We embroidered some adorable Halloween flour sack towels this week. Mermaids were required and I saw this really cute artwork of a witch mermaid riding on a trident in front of the moon. 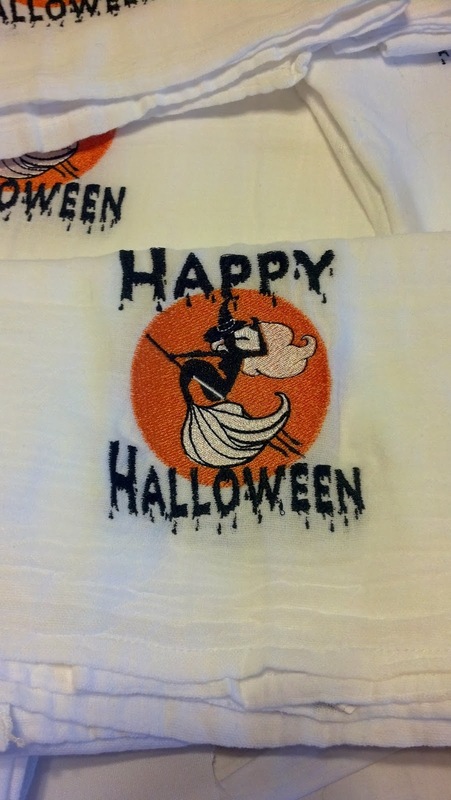 The digitizing was done and the Happy Halloween was a stock design. It was all put together and turned out pretty darn cute. On Friday the federal court called with a message that they don’t need me for jury duty on Monday. So, it is back to work on Monday for me. Windows 8 is a piece of cake. At first we were leery about it because the periodicals said it is so different from Windows 7. However, you can turn the screen into the Windows 7 screen. The functions are a bit different. Everything seems to take an extra step to do, but it really isn’t that difficult. Of course, the internet is the same. The plumbing in the green house a/k/a Studio still isn’t working perfectly. Our handyman was called and after using his 30 foot auger, decided that the septic tank needs to be drained. Those people are coming on Tuesday. Oh hurray. Hope that works. I hate it when old people poke me at wedding and say "You're next!" So I have started doing the same thing at funerals. A lawyer returns to his parked BMW to find the head lights broken and considerable damage. Theres no sign of the offending vehicle but he's relieved to see that there is a note stuck under the windshield wiper. " Sorry. I just backed into your Beemer. The witnesses who saw the accident are nodding and smiling at me because they think I'm leaving my name, address and other particulars. But I'm not." "If there are any idiots in the room, will they please stand up" said the sarcastic teacher. After a long silence, one freshman rose to his feet. "Now then mister, why do you consider yourself an idiot?" enquired the teacher with sneer. "Well, actually I don't," said the student, "but I hate to see you standing up there all by yourself." Fred and his wife Edna went to the state fair every year. Every year Fred would say, "Edna, Id like to ride in that there airplane." And every year Edna would say, "I know Fred, but that airplane ride costs ten dollars, and ten dollars is ten dollars." One year Fred and Edna went to the fair and Fred said, "Edna, Im 71 years old. If I dont ride that airplane this year I may never get another chance." Edna replied, "Fred that there airplane ride costs ten dollars, and ten dollars is ten dollars." The pilot overheard them and said, "Folks, Ill make you a deal. I'll take you both up for a ride. If you can stay quiet for the entire ride and not say one word, I won't charge you, but if you say one word it's ten dollars." Fred and Edna agreed and up they go. The pilot does all kinds of twists and turns, rolls and dives, but not a word is heard. He does all his tricks over again, but still not a word. They land and the pilot turns to Fred, "By golly, I did everything could think of to get you to yell out, but you didn't." Fred replied, "Well, I was gonna say something when Edna fell out, but ten dollars is ten dollars." Does anyone know how we got to “No. 51” when there are 2 months remaining in 2013 and I send this e-newsletter out weekly? I think I may have misnumbered something along the line. Oh well, I’ve never been very conventional. For sometime now George and I have discussed getting new computers and leaving one set at the studio and the other set for use at home. Is that the height of laziness or what? There are some valid reasons, though. One is to make our computers last longer and to help back up. Also, if one goes out on us, we will have another. After last week’s computer debacle it became apparent that now is the time to get the new computers and we did. They are laptops and came with Windows 8. They were very easy to set up. Windows 8 is very different than Windows 7. I think we have figured it out now. The new laptops only have 2 USB plugs. Guess we didn’t check to see how many USB plugs there were before purchasing. I need about 7 of them. Then we purchased USB hubs. The new laptops do not have a CD/DVD drive. So, we purchased that. Luckily our Office Professional 2003 was able to install. Now I have to find and figure out how to install QuickBooks 2011. I bet I have to buy the new QuickBooks before it is all over. 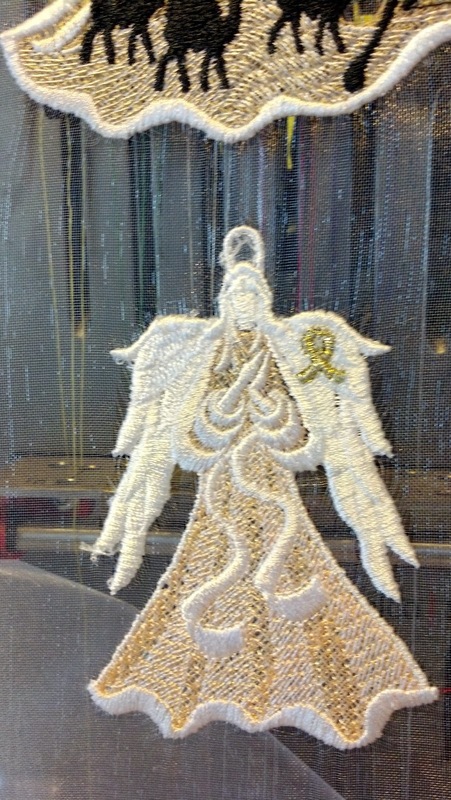 Then the embroidery programs will need to be installed. We still have more computing to do. The external hard drive that I purchased and did not work is becoming a thorn in my side. I can’t seem to get the people at Western Digital to respond to me and the extra warranty that I purchased from Amazon won’t let me file a claim until I send my receipt. The only receipt that I have is an email and I cannot seem to get their email address to accept it. Basically it was another week spent working on computers. Jury duty has been postponed for another week. 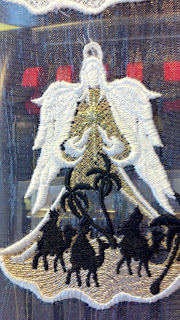 We have been embroidering every day. 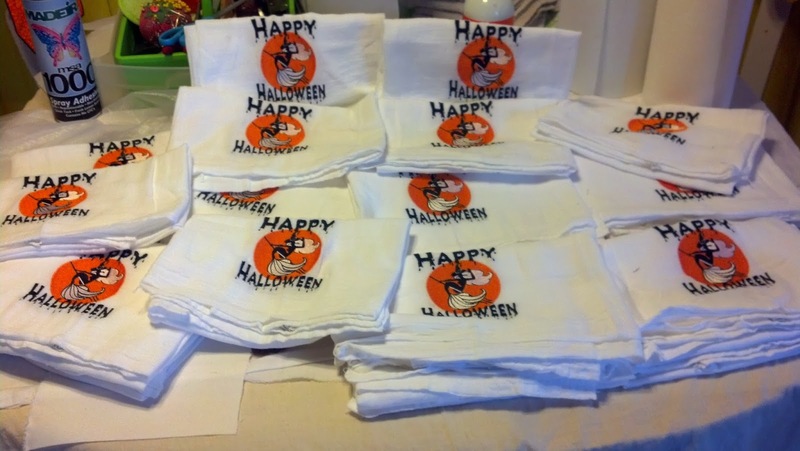 George is working on some really cute Halloween towels. I worked on a peacock; then a huge fleur de lis sham; and, now I’m working on more embroidery on my curtains. Etsy changed some things, too. Nothing changed that is really noticeable to shoppers. It was more background items. Now we have an “About” page. Yesterday I attended a beautiful wedding on the beach. I don’t recall ever attending a beach wedding. It was beautiful and fun. No shoes. Since the mother of the bride is our krewe member and dance teacher, you have to know that everything involved dancing. Oh what a fun time that was. Everyone was still partying when I had to leave. Why can't witches have babies? Hollow weenies. This past week was a light work week. When the time is available it is always a good thing to prepare for the upcoming seasons. There is always so much to do. 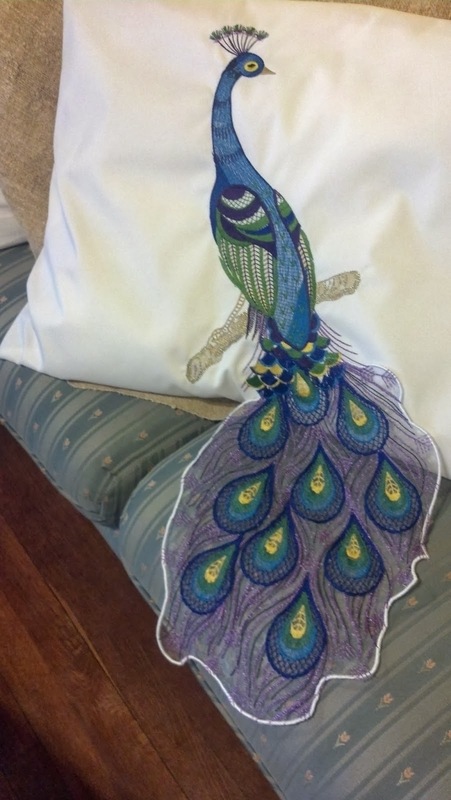 The peacock pillow was stitched out and looks great. The design is a bit smaller than our usual designs though. Nevertheless, it is beautiful. 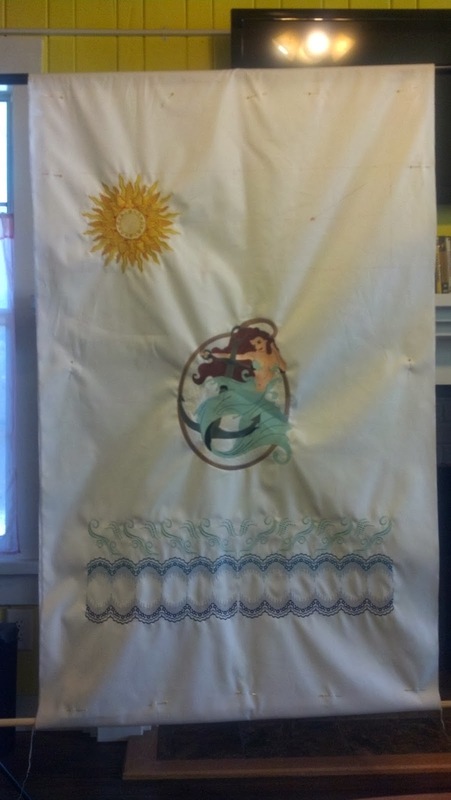 The mermaid design has not been completed. The living room/entrance room in the studio house is pretty empty. 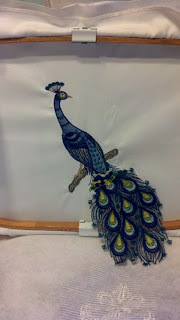 The idea was to create an embroidery display room. Displaying is not as easy as originally thought. Searches on Pinterest for display ideas have produced many ideas. Since we already have a few sheets of foam board, triangles were cut from the foam board and attached to each other to create a Christmas tree, in an abstract kind of way. 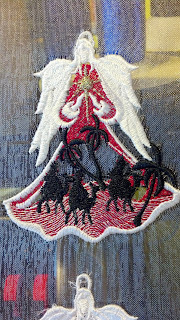 The various embroidered Christmas ornaments that have been made were pinned to the tree. It kind of looks nice. There is more room on the tree for additional ornaments, even after embroidering lots of lace ornaments. It was surprising to find how many ornament designs we have. 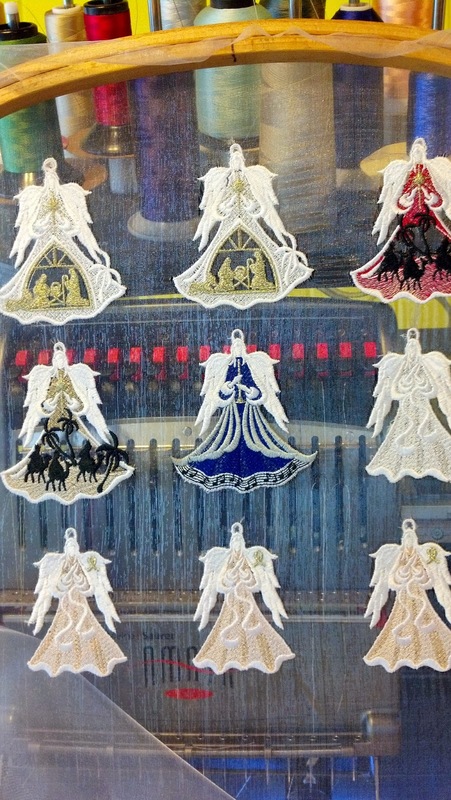 Most of the ornaments are lace. 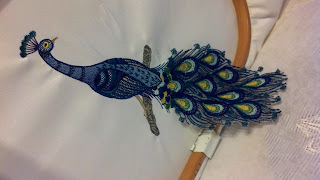 Lace embroidery always means lots and lots of stitches. No doubt it is beautiful but since embroidery is priced per thousand stitches, the stitch count becomes very important. We definitely want our customers to have beautifully embroidered items but that is always weighed with stitch count. The customer needs to get the most bang for their bucks. 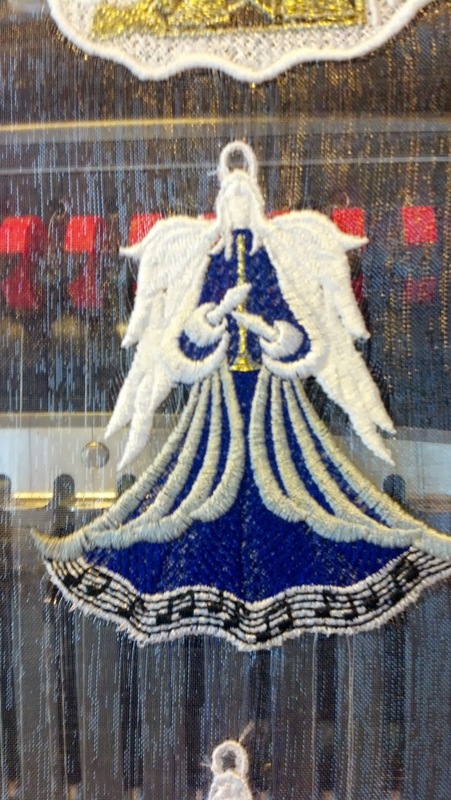 One way of doing that is keeping the shape of the design but using more of an appliqué technique. There are several lace designs in our repertoire that are intriguing but have not been stitched out yet. Looking at the Christmas designs and stitching them out gave me the bright idea to look online at some websites that haven’t been visited in a long time. 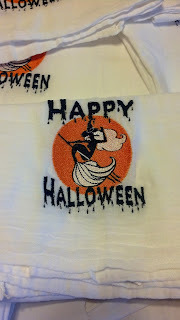 I used to be on top of all of the home embroidery designs and techniques. OMG! The home embroiderers are so creative and talented. It only took viewing a few pages of some of these websites to get the creative juices flowing. One of the first things that hit is that I’m working on Christmas and don’t have the studio decorated for Halloween. 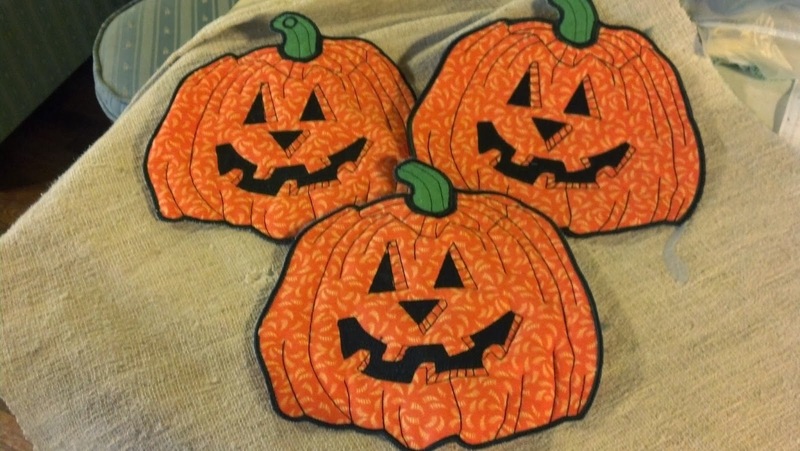 Perusing our designs and searching for pumpkins, I did find some appliquéd pumpkins but they weren’t what I wanted. There was one pumpkin design done in red work that really jumped out. 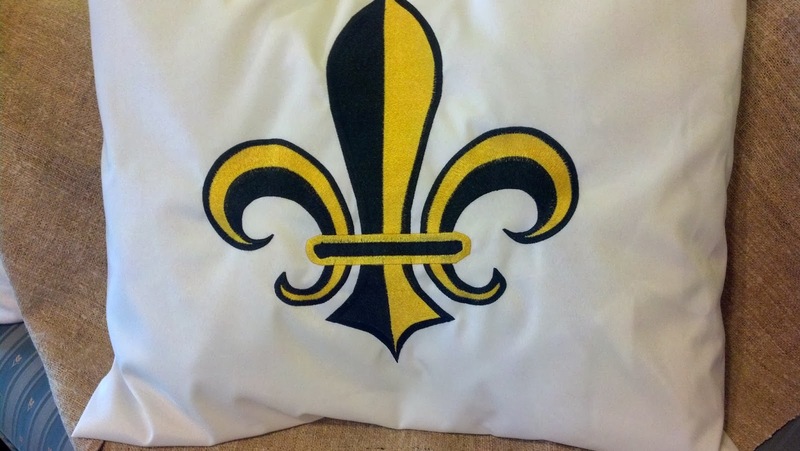 I took the design, increased it to 8” and created an appliqué from the outline. 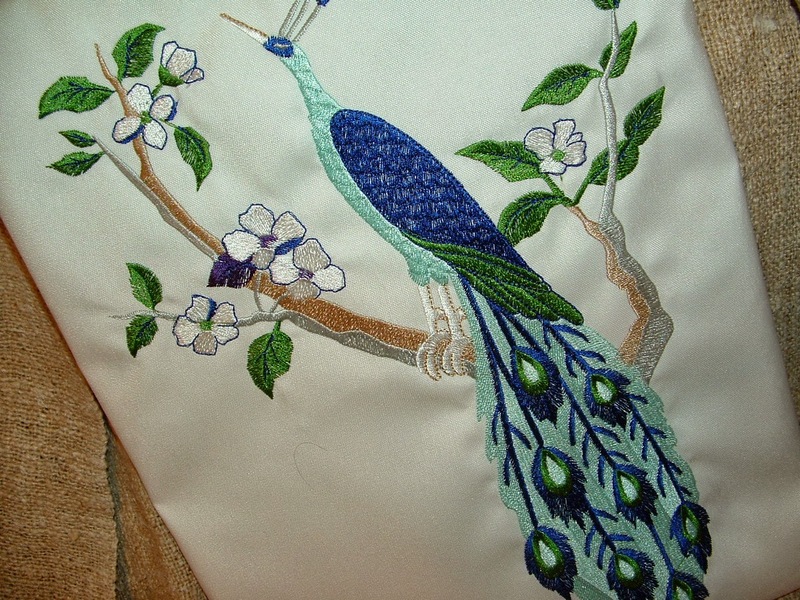 Although I believe the home embroiderers are leaps and bounds beyond the commercial embroiderer in ideas, there is one shortcoming. That is that most home embroiderers are limited to the largest hoop size their machine will hold, which is usually 5”x7”. 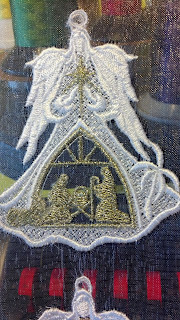 Just because their hoop is 5x7 does not mean that they can embroider a 5x7 design. There must be a margin on all 4 sides. In practical application this means their largest design could not be larger than 4x6, and that is stretching it. 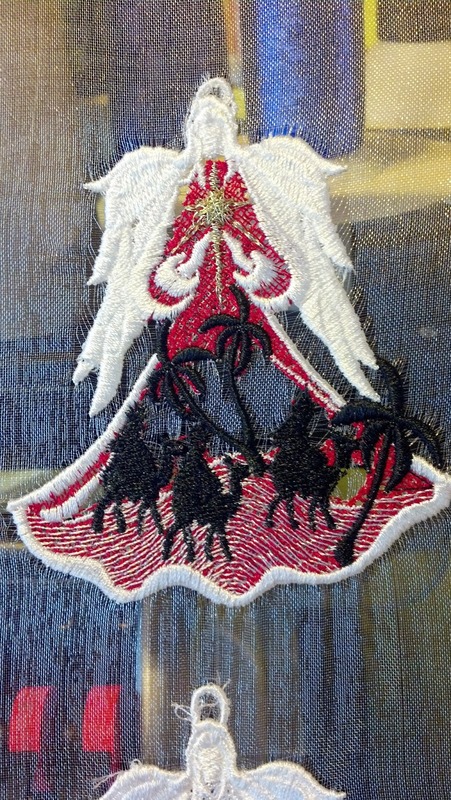 If they want to make something larger than their hoop, it becomes continuous embroidery. They usually just make everything fit into their hoop. When it comes to things like pot holders, the designs are too small. We have hoops much larger than 5”x7” and can make items the appropriate size. A pot holder should be about 8” square. That is not possible in a 5x7 hoop, but is perfect for my 12” square hoop. As with all designs, once the design is created, there are a few trial runs to tweak the design. 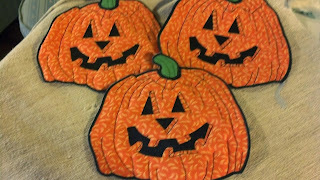 Our hot pads and pot holders are turning out adorable. 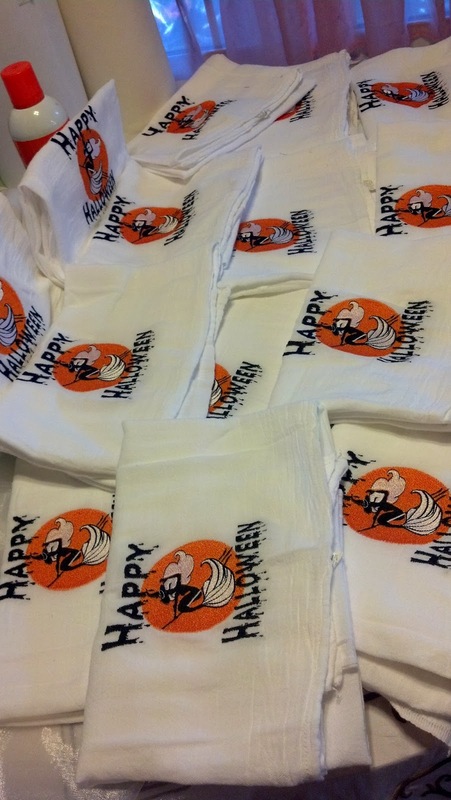 There was excitement in our Etsy store this week. A lady requested two custom made lace handkerchiefs just like the beige and white one that is listed. We created a custom order for her but she never paid and the hankies were never sent. She said she needed them by Friday or Saturday. The due date is over so that turned out a no sale. 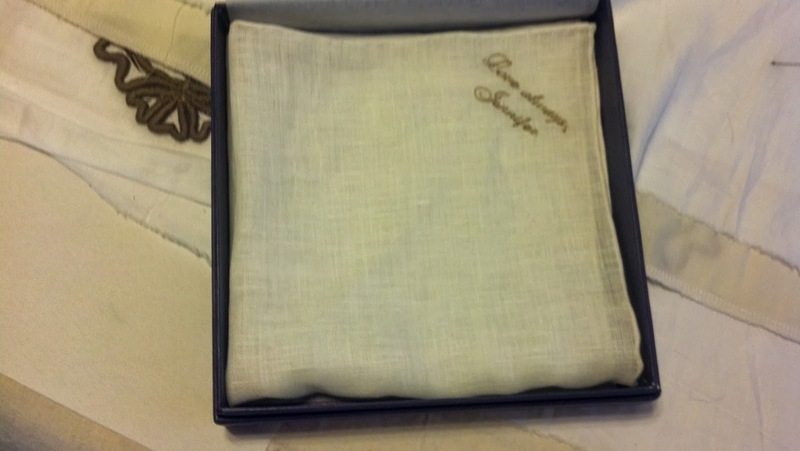 On the bright side, now we have 3 of the beige and white lace handkerchiefs. Last night George took me out on a date to the beach for the Pensacola Beach Song Writers’ Festival. We went to our usual Paradise Bar & Grill, drank Bushwhackers, and listened to some great music. We ran into several friends. All in all it was a pretty wonderful evening. The weather was beautiful. There just is nothing like the beach, music, drinks, and friends. Four surgeons are comparing the type of patients they consider the easiest to operate on. The first surgeon says, "I like to operate on electricians, because when you open them up everything is color coded." The second surgeon says, "I prefer to operate on accountants, because when you open them up everything is numbered." The third surgeon says, "I think librarians are the easiest to operate on because everything inside them is in alphabetic order." The fourth surgeon says, "I've got you all beat. I like to operate on politicians best. They are by far the easiest because they have no guts, no heart, no spine and their head and behind interchangeable."